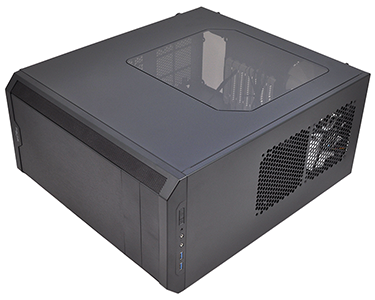 Fractal Design has revamped its value-focussed range of Core Series enclosures with the launch of three new models. In keeping with earlier efforts, the 'X5' refresh is all about "providing the core features and performance of Fractal Design’s case lineage at an aggressive price point." 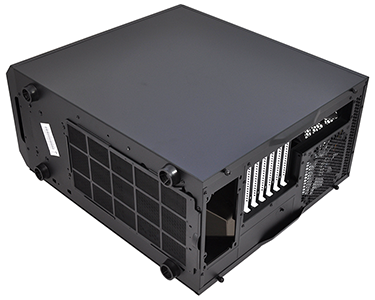 The new range is composed of the Core 1500, a compact mini-tower for micro-ATX boards, the Core 2500, a more traditional mid-tower, and the Core 3500, a wide-bodied, mid-tower solution for high-performance parts. It's the latter that's under the spotlight today so let's dive in for a closer look. At launch, the Core 3500 will be available in two flavours: a standard model priced at £60 or a windowed version for £68. 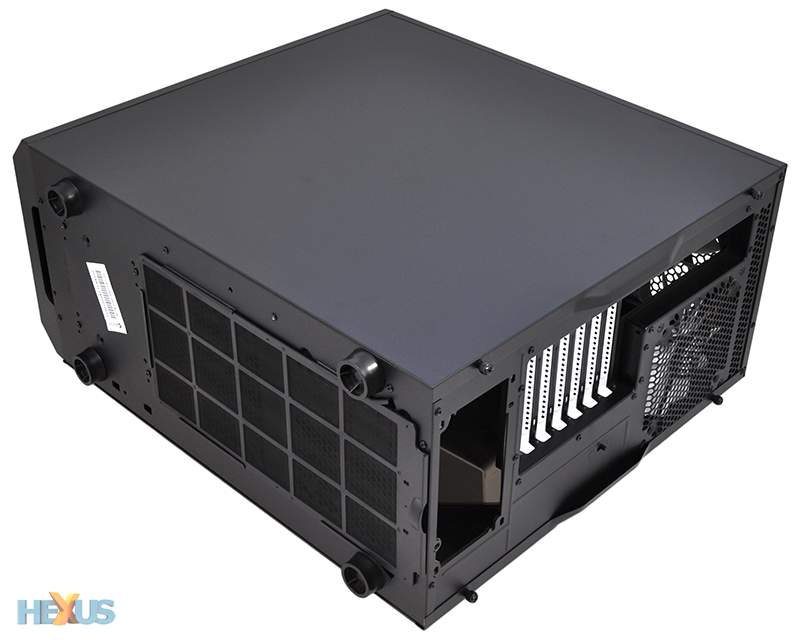 Both stand at 233mm (W) x 465mm (H) x 517mm (D) in size and are designed to take full advantage of enthusiast parts such as liquid-cooling radiators. 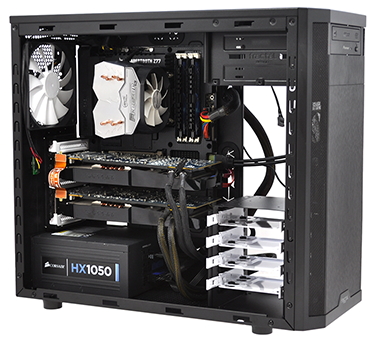 From the outside, the Core 3500 is a fairly simple-looking box and one that is not too dissimilar to 2011's Core 3000. It's the usual black steel frame, with tinted side window and white highlights on the expansion slots and internal drive bays. Simple is no bad thing, mind you, as for a budget case the Core 3500 looks sleek and streamlined. This time around, the all-mesh front has been dropped in favour of a plastic fascia sporting a brushed-aluminium effect with mesh columns either side. It works well enough, though as is to be expected on a budget case, the materials are on the thin side and exhibit noticeable flex, while the overall finish is below-average for a near-£70 case. Fractal's side window is of a good size and sits flush in the thumb-screwed panel, though do be aware that the tint is quite dark, and you'll probably need some form of internal lighting if you really want to show your components off. We like the fact that the majority of the body has been left free of clutter - even the Fractal logo is unobtrusively positioned at the bottom of the front panel - and there's plenty of room for custom modifications or decals. Similarly, the I/O panel is logically placed on top and features only the essentials - power and reset buttons, audio and mic jacks, as well as a pair of USB 3.0 ports. And remember those awkward multi-coloured LEDs on the Core 3000? Well, they have thankfully been replaced, as the power button now has a white backlight and is joined by a small white LED for drive activity. Stepping inside provides a truer feel for the Core 3500's capabilities. 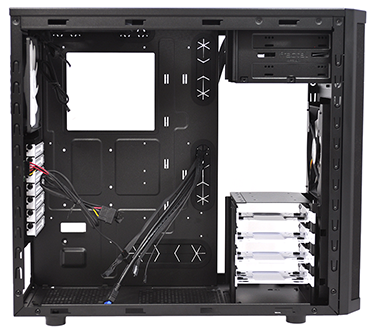 The default specification provisions for two 5.25in optical bays (neither of which is tool-free, sadly) as well as four 3.5/2.5in drive trays in a removable cage and two 2.5in SSD mounts fixed to the rear of the motherboard tray. It's good to see the drive-cage outfitted with metal trays and rubber standoffs, but be aware, the dedicated 2.5in SSD bays are only accessible before motherboard installation. Cooling, meanwhile, comes in the form of three pre-installed fans; a 140mm front intake; a 140mm top exhaust; and a 140mm rear exhaust. All three fans are from Fractal's Silent Series range and run at speeds of up to 1,000RPM. What's handy is that there's a three-way fan controller included as standard. This small accessory is fixed to the back of the chassis near the seven expansion slots, sources power from a Molex connector, and offers low, medium or high operating modes. Looking beyond the three pre-installed fans, a total of six 120/140mm fan-mounts are available in total. Two up front, two up top, one at the back and one at the bottom. This, of course, means radiator mounting opportunities aplenty. You could, if you so wanted, install 240/280mm radiators up front and up top, as well as a 120/140mm radiator around back. There's a good amount of potential on offer here, but building into the Core 3500 did uncover a few possible shortcomings. Firstly, there's only one easily removable mesh filter - it lines the bottom of the PSU and pulls out nicely - but the case is open to unwanted dust in other areas. The top fan mounts have no protection at all, while the forward intakes can only be cleaned by pulling off the front panel. Complicating matters, removing the front panel entails removing any installed optical drives first, and remember, they aren't tool-free so will need unscrewing. 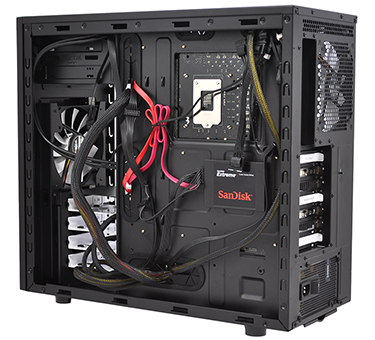 The motherboard standoffs also aren't pre-installed, which can be a mild inconvenience for users wanting a quick build, and the position of the fan controller isn't ideal as it a) obstructs the upper expansion slots and b) makes cable management a little more tricky than it might have been. Speaking of cables, the front-panel audio connector on the Core 3500 is particularly short, and wouldn't reach the associated port on our Asus Sabertooth Z77 motherboard. These are inconveniences that would-be buyers should be aware of, but they are offset by a number of plus points. 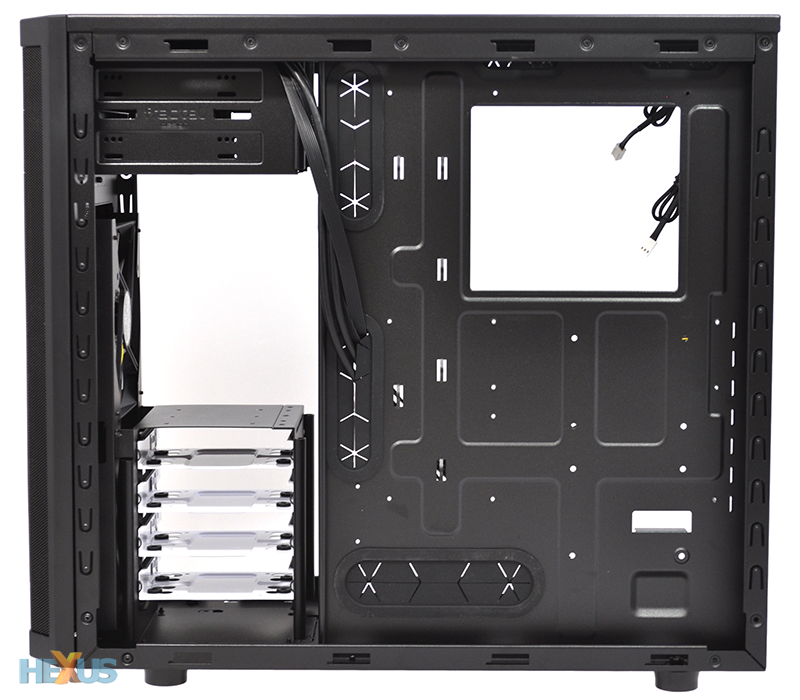 A good-sized, 22m gap is made available behind the motherboard tray as a result of the chassis' extra-wide body, and there's plenty of space here for excess cabling. 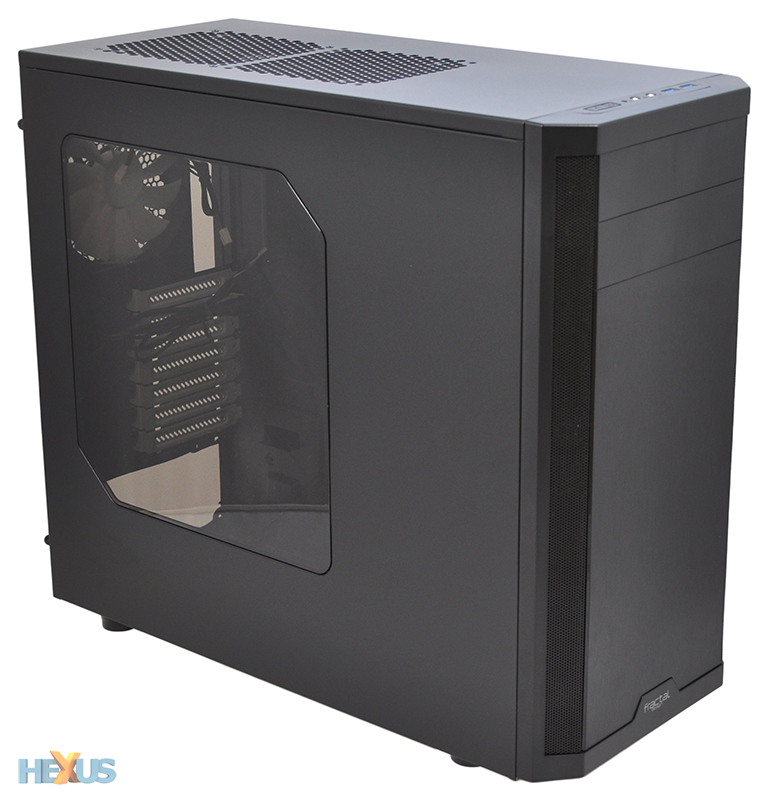 Furthermore, the roomy interior can accommodate CPU coolers standing up to 180mm in height, as well as graphics cards measuring up to 430mm in length. Our high-end, dual-graphics test platform slotted in with relative ease, and with rubber-grommeted cable-routing holes, the end build looks pleasantly neat and tidy. Let's now take a look at cooling performance and noise.